Achieving perfect, straight teeth takes a lot of effort and visits to the dentist. Although conventional braces have been proven to treat your crooked teeth and give you a celebrity smile, they can also be quite painful and some cases you need a permanent retainer to maintain the teeth’s straight profile, even after the braces are gone. At Bondi Dental, we offer an alternative for getting those perfect pearly whites. Myobrace treats your crooked teeth, straightens them the natural way without the underlying disadvantages of conventional braces. Bondi dental is a certified Myobrace provider in Bondi. If you are interested in straightening your teeth without braces, visit your reliable dentist at Bondi Dental today. The Myobrace System is a preventive pre-orthodontic treatment that aims to not only create perfect straight teeth but also solve underlying orthodontic issues. Myobrace is similar to the conventional braces, with a few important distinctions. Unlike conventional braces, which immediately correct the dental issue, Myobrace focuses on addressing the root cause of the issue. For instance conventional braces treat the symptoms of crooked teeth immediately, but Myobrace seeks to answer the cause of the crooked teeth and from there begin to treat it. The treatment does this through proper education of the wearer, a series of exercises and wearing of a removable intra-oral appliance for 1-2 daytime hours and overnight while sleeping. These poor dental habits, also called Myofunctional habits, are found to be a critical cause of crooked teeth and not just hereditary influences, unlike previously believed. The Myobrace system therefore is a system of habit correction. Orthodontic treatments are proven to be effective ways to straighten the teeth and correct one or more issues. Myobrace can also do this and a lot more! 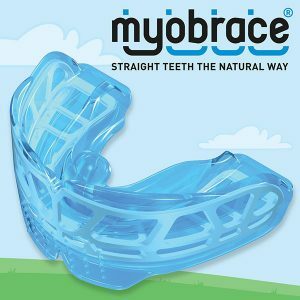 Myobrace has several clear advantages over Conventional Braces. Straightens teeth the natural way. Teeth remain straight, hence no need for permanent retainers. Corrects the cause of the problem. Removable and convenient. You only have to wear it for 1-2 daytime hours and overnight during sleep. No extraction of teeth needed for you to wear it. Reduces root and enamel damage to the teeth. Achieving perfect straight teeth is now natural with Myobrace. At Bondi Dental, achieving those pearly whites also comes with healthier results. Experience natural way of straightening your teeth without the pain and discomfort at Bondi Dental today. Call us at (02) 9365 7187 or request your appointment online today!